I mentioned yesterday that I signed up for a 14-day trial period with Ancestry.com. It has proven very useful so far, turning up various census and death records. If it continues to be useful, I will have to consider paying the very expensive membership fee--more than $300 a year or about $40 a month for access to their worldwide databases. I'm going to try to get as much use of it as I can in the trial period. Two things of note I discovered today. I was doing searches on some of the Ratner children and was able to follow George and wife Emma to Englewood Cliffs, NJ, in 1920, where he was listed as a grocery proprietor. Household members were wife Emma, daughter Marjorie (age 2) and Emma's mother Louise Paeglow. From there I can follow Marjorie into her marriage with Robert K. Decker, evidently known as Ken. Marjorie and Ken appear to still be living at age 89 and 91 at 20 Willow Dr. in Delmar NY, outside of Albany. The phone number listed is 518-478-0208. We know that Marjorie (Stan's first cousin) and Ken had two sons, Kurt and Ronald, but I have not yet been able to find them among the many Deckers with those first names. But much more exciting than any of that is this morsel, Walter Ruby's draft registration card from June 5, 1917, apparently filled out in his own hand. He lists his name as Walter Ruby Rabinowitz. It provides an exact birthdate for him, October 15, 1893, a datum we may not have had. He lists his occupation as "salesman" with (as best I can make out) Lenox Novelty Co., located at 109 Lenox Ave. in New York City. He is 23 years old and writes that he is a "natural born" citizen. This main bar is part of an article originally published in Family Tree Magazine's special issue "Discover Your Roots" in Summer 2014. My brother Walter had what he described as his “Alex Haley moment” when he figured out the connection between our great grandfather and a renowned 19th century Russian rabbi. He was at Yeshiva University's research library in New York boning up on the life and teachings of Rabbi Isaac Elchanan Spektor, the chief rabbi in the Russian city of Kovno (now Kaunas in Lithuania) for whom Yeshiva's theological institute is named. Walter had recently written a narrative family history in honor of our parents, which included the legend that our ancestor Joseph Rabinowitz was related in some way to the great man. Now Walter was preparing to walk in Spektor's steps on a roots journey to Kaunas and surrounding districts, with an article assignment to write about his experiences. Paging through the primary English-language source on Spektor, Walter sat up when he read a biographical detail he had not seen elsewhere in the literature. According to the author, Spektor had a grandson by the name of Joseph Rabinowitz who had lived with and studied under him in Kovno in 1874. That was the year before our pious ancestor of the same name and age arrived from the Russian Pale to begin a new life in New York. The text explained that Joseph came under Spektor's care following the sudden death of his father, Spektor's first son Chaim Rabinowitz. (All of Spektor’s children used the surname Rabinowitz, meaning son of the rabbi.) The author wrote that Joseph studied with the rabbi “until he became highly proficient in Talmud and Jewish codes.” Walter conjectured that Spektor also made arrangements for his marriage and then sent him off to America as a sort of emissary. This would become the premise of Walter's article, “A Few Things Are Illuminated: A Wild and Crazy Roots Tour to the Old Country.” The rollicking account of his adventures, including a surprising criminal assault to which he attached symbolic meaning, ran in a New York Jewish weekly in 2008 and is hosted online at a journalism review site. Now our family legend was in the public record, fully fleshed out with colorful detail and sweeping reflections. And it was wrong. 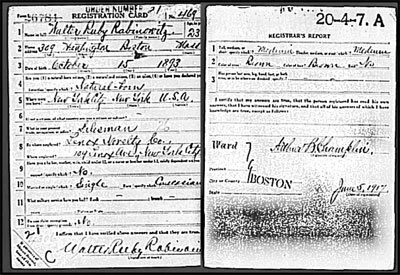 Several years later, after an extended search for our ancestor's very common name in the New York City vital records, I finally identified the 1917 death certificate for our Joseph Rabinowitz. It listed his father's name as Abraham, which was a problem since the father of Spektor's grandson was Chaim or more formally Aryeh. This discrepancy, combined with doubts about the plausibility of the emissary theory given that Joseph Rabinowitz was not among Spektor's American followers who founded the seminary, led to the conclusion that our great-grandfather was not, in fact, the grandson of Rabbi Spector. Sometimes intuition fails us. Natural story tellers like my brother are subject to a particular bias; they want the story to be concise and coherent. In service of a good yarn, they may make too much of a particular detail or overlook contradictory evidence. They are more interested in the arc and perhaps the moral of the story than they are in precise verisimilitude. This kind of narrative bias is just part of the problem. If a story can go wrong on any single telling of it, how reliable can it be after being passed down through generations? Experts have a name for this phenomenon: retrospective falsification. Robert Todd Carroll, an advocate of skeptical thinking, includes it in Unnatural Acts among a rogue’s gallery of 59 biases and logical fallacies that can beset the unwary. “Stories get distorted and falsified over time by retelling with embellishments, including speculations, conflating events, and incorporation of material without regard for accuracy or plausibility....The distorted and false version becomes a memory and record of a remarkable tale,” writes Carroll. Legend embellishment isn’t always accidental. One of the main motivations for mistaken legends is a desire for family aggrandizement, as I have learned since becoming a minor expert on the life and career of Rabbi Spektor. I have been contacted by no fewer than nine other family researchers claiming a family relationship with the rabbi. Only two of the claims had merit. In my family's Spector case, deeper investigation revealed a more plausible though still-unproven explanation for the legend—that the mother of our Joseph Rabinowitz was related to the wife of Rabbi Spektor. That would be a less impressive relationship but still one with some cachet among Jewish American immigrants. Such castle-building was hardly unique to Jews. In the classic case of the Smalley-FitzRandolph pedigree, described by Milton Rubincam in Pitfalls in Genealogical Research, it was shown that several scholarly publications in 1908 fraudulently asserted a genealogy claim in order to qualify family members for eligibility in the Mayflower Society. Years later, when the claim was questioned, the society instituted a project to reinvestigate all Mayflower families and adjudicate contested cases. With so many opportunities for error, either accidental or deliberate, every family legend gets distorted in a unique fashion. You have to dig into the facts to learn where on the scale from substantially true to flat-out fictitious your legend lies. Most likely it is somewhere in between. Three cases in the genealogy literature bear this out (see sidebar). On top of all the reasons that family stories go wrong, now add the ability of the Internet and social media to propagate erroneous information far and wide. We know from the urban legend chronicler Snopes.com how rogue informational memes propagate on the Internet without regard to accuracy. One such from the Snopes files, an oft-recycled legend about prominent politicians whose ancestor who was hanged as a horse thief, shows how genealogy legends can grab the interest of the general public. So what is an honest and diligent genealogy researcher to do? How are we to evaluate claims that are made, pick out the nuggets of truth, and shed the embellishments and outright fictions? How do we use our abilities not just to puncture sacred cows but to honor the legend by discovering its heart and writing its history? Your mission as a genealogy investigator is to seek the truth. You want to describe the reality of past circumstances so as to illuminate the lives of our ancestors and ourselves. It does no good to perpetuate stories and legends that are untrue or misleading. We investigate genealogy mysteries using the same critical thinking skills used in any field that seeks to discover the truth from a set of facts. The experimental scientist, investigative journalist, diagnostic doctor, homicide detective, and you all face the same challenge: to make sense of partial information and arrive at a logical explanation that fits the evidence. "The most distinctive features of the critical thinker’s attitude are open-mindedness and skepticism,” writes Carroll in Becoming a Critical Thinker. “These characteristics may seem contradictory rather than complementary. On the one hand, a critical thinker is expected to consider viewpoints different from his or her own. On the other hand, a critical thinker is expected to recognize which claims do not merit investigation." In genealogy research, the scientific method has been encapsulated in a professional standard called the genealogy proof standard, which specifies a five-element methodology for establishing proof. In 2000, the Board for Certification of Genealogists distilled the field's best practices for determining accuracy and published a comprehensive standards manual to support the overall proof standard. The recently published Mastering Genealogical Proof by Thomas W. Jones offers a practical program for learning and practicing exemplary research methods. (Elizabeth Shown Mills is the author of several other books on the same topic.) Jones describes the research reasoning cycle as comprising five phases that correspond to the proof standard elements: framing a question, gathering evidence, testing hypotheses, establishing conclusions, and documenting proof. Genealogists must practice critical thinking skills at each stage in order to succeed in their work. Achieving the full genealogical proof standard as done by Lenzen in her heritage-book investigation is a high bar for non-professionals, and is probably beyond the ambition of most hobbyist researchers. Still there are minimum standards that anyone with a serious interest should follow when evaluating sources, interpreting data, and presenting a case. These 12 investigative techniques, gleaned from my years of hard knocks doing family history research, may not get you all the way to a gold-plated genealogical proof. But they will serve you well as an investigator’s toolkit as you work to separate fact from fiction in your own family legends. I noticed that we have gotten some Israeli visits and used the Blogger statistics function to track down the source. The Ruby Family History Project is listed of the "Blogs of Interest to Jewish Genealogists" page of the Israel Genealogy Research Association. See it here. It takes a while to load but be patient. There is a translate function in the left sidebar.